Shriek! 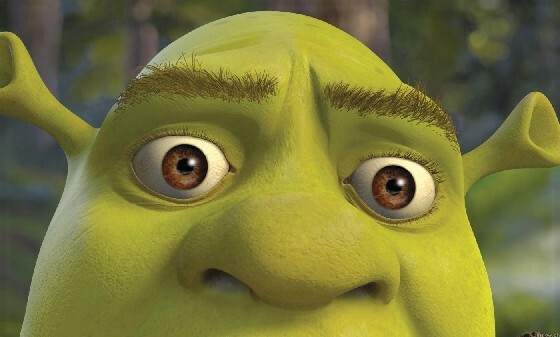 Shriek muffins? 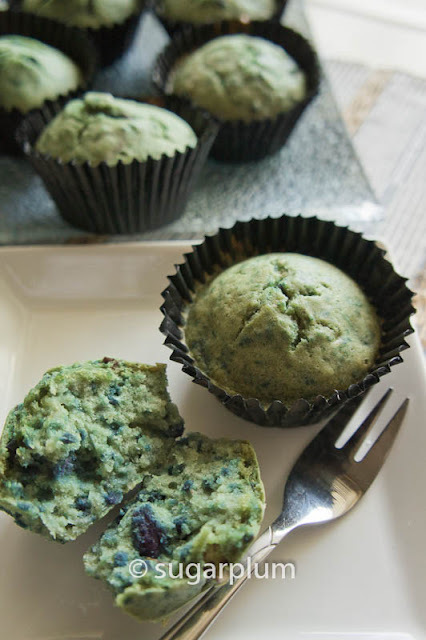 Shrek muffins? Bright green muffins! 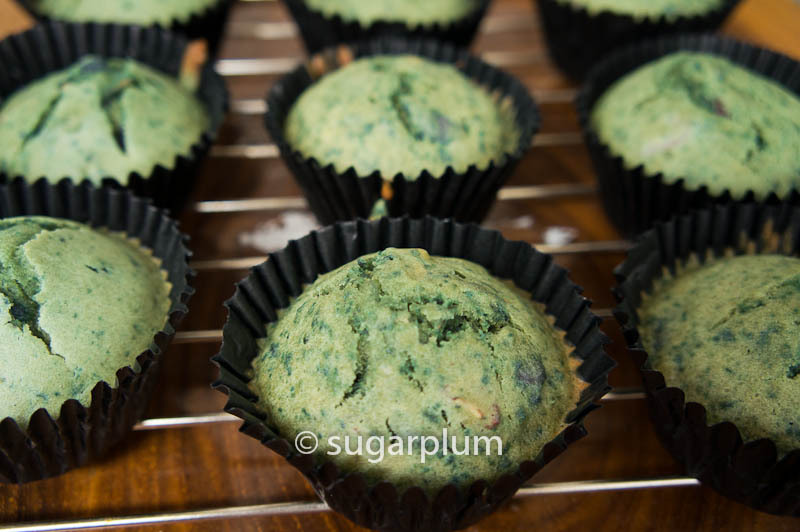 How on earth did purple sweet potatoes morph into green muffins which resembled a certain Disney Dreamworks ogre? I swear they started out as purple-gray batter. I had some purple sweet potato and thought of turning them into muffins this time. The last recipe I made with sweet potatoes was turning them into steamed sweet potato buns. This recipe called for the orange variety, but I thought nevermind… can substitute-lah. Orange or purple, still sweet potato. Just different colours. What can go wrong? Hah. And go wrong it did. It turned green. I thought it was the oven light playing tricks on me. Luckily it was a bright green, almost a lovely deep emerald. Not any pale seasick green. I turned green when I saw them. My parents keeled over laughing. My cousins went overboard. 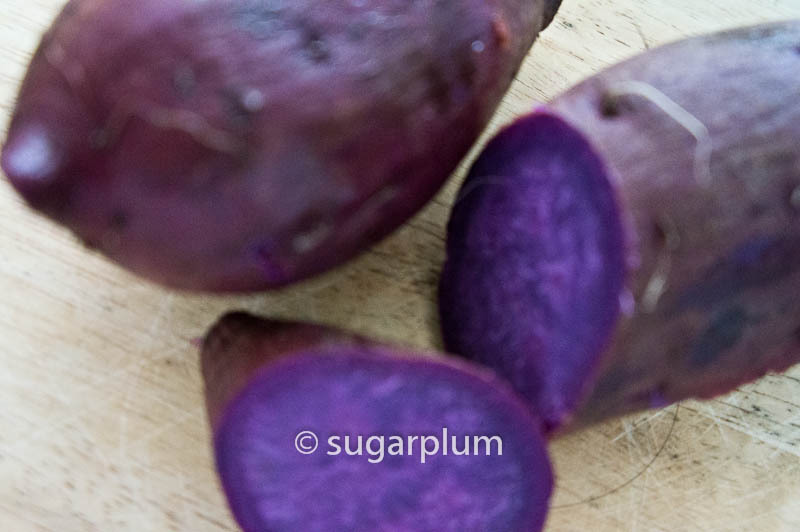 Purple sweet potatoes turn green after baking because it reacts to the presence of baking soda and baking powder. Aha. Learnt something, right? Looking at the brighter side, it wasn’t so bad after all. So what if it was green? It is all natural, no artificial colouring used. 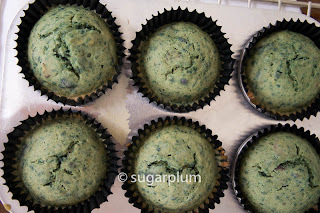 With sweet potatoes, the muffins had a naturally high fibre content. Perhaps I could tempt a leprechaun with it and reserve it for St Pat’s next year? In case you are wondering, no, I didn’t forget to insert the recipe for this. I’m not sharing the recipe because I wasn’t happy with the muffin texture. The recipe needs some work. Glad you found it funny too. Is the recipe for this ready? Would love to try it out! Hi Ping, it isn't ready yet as I've been rather distracted. I'll be sure to post it up when I do. How about checking out the Steamed Sweet Potato Buns, or the Steamed Pumpkin Muffins instead? Thanks for dropping by!